Ear wax is actually called “cerumen” by scientists and doctors, and it’s not actually even wax in the traditional sense. It’s an ear-cleaning solution that’s made specifically by your ears to keep your ears clean. So just let it do its job, for crying out loud. It traps stray dust and dirt, preventing it from getting deeper into your ear canal. Then, as you go through your day talking, chewing and yawning, those actions actually move the soiled ear wax down and out of the ear canal where you can easily wipe it out with a washcloth during your shower. Furthermore, if you try to dig out the ear wax with a fingernail, swab, fork, pencil, key, chopstick or other pointy foreign object, you’re actually reversing your ears’ self-cleaning mechanisms by pushing soiled cerumen further into your ear canal with all the dust and dirt it’s collected. If you keep doing this, that old ear wax can get clogged against your ear drum. So stop it. Repelling insects. That’s right. Insects find the smell of ear wax annoying, so they avoid flying into your ears. Protects ears against viruses, bacteria and fungal infections. For most people, cerumen is slightly acidic—a helpful property that hinders bacterial and fungal infections from taking hold inside your ears. Thanks again, ear wax! If you’ve spent most of your life swabbing ear wax out of your ears without realizing how dangerous it was to dig out that ear wax, you’re not alone. Just understand that at this point, you probably need to visit your hearing care professional to have him or her look into your ear and possibly remove impacted ear wax that could be damaging your ability to hear. Another thing to understand is that not all ear wax is created equal. While most people make the ear wax that’s right for their ears, there are some people whose glands make either too little or too much ear wax. Some people’s ear wax is either too dry or too wet. Sometimes the chemical composition does not adequately protect against infection. Regardless of any of these problems, you should never stick anything into your ear for ear wax removal. See your hearing care professional for personalized recommendations and assistance. One more thing: Improper hearing aid hygiene can also cause ear wax impaction. To avoid this, be sure to follow your hearing care professional’s recommendations on gentle ear washing and regular cleaning of your hearing aids to keep the balance right and your hearing clear. Every year, 12,500 American children have to go to the doctor from ear cleaning injuries. Millions of parents still think that ear cleaning is as necessary a hygiene item as teeth brushing. But often the kids do it to themselves. The most common of these injuries include tympanic membrane tears (torn ear drum) or other small cuts and lacerations inside the ear canal. Just hop in the shower and get clean. While you’re doing that, just gently wipe around the outside of your ears (front and back), but don’t jam the washcloth into your ear canal. This should just remove the already expelled ear wax that has completed its cleaning duties. When you’re done, just towel off the excess water and you’re finished. 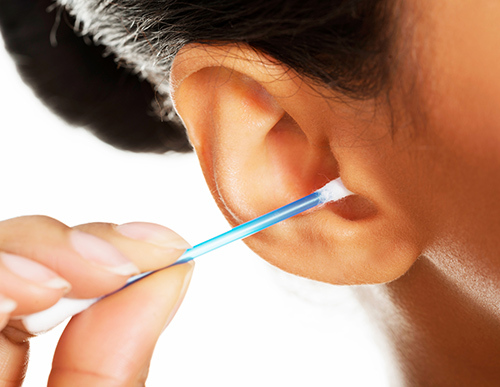 You don’t need to (and shouldn’t) follow up with swabs in the ears unless you only swab around the very outside of them—never inside the ear canal! The ear wax inside is still doing its important work.